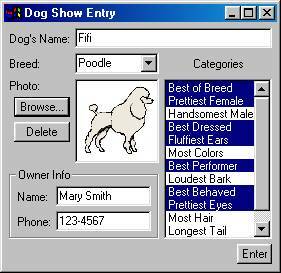 When writing applications in SWT, you may need to use layouts to give your windows a specific look. A layout controls the position and size of children in a Composite. Layout classes are subclasses of the abstract class Layout. SWT provides several standard layout classes, and you can write custom layout classes. In SWT, positioning and sizing does not happen automatically. Applications can decide to size and place a Composite’s children initially or in a resize listener – or they can specify a layout class to position and size the children. If children are not given a size, they will have zero size and they cannot be seen. The diagram below illustrates a few general terms that are used when discussing layouts. The Composite (in this case, a TabFolder) has a location, clientArea and trim. The size of the Composite is the size of the clientArea plus the size of the trim. The Composite has two children that are laid out side by side. A Layout is managing the size and position of the children. This Layout allows spacing between the children, and a margin between the children and the edges of the Layout. The size of the Layout is the same as the size of the Composite’s clientArea. Here is the relevant portion of the example code. First we create a FillLayout, then (if we want vertical) we set its type field, and then we set it into the Composite (a Shell). The Shell has three pushbutton children, B1, B2, and Button 3. Note that in a FillLayout, children are always the same size, and they fill all available space. RowLayout is more commonly used than FillLayout because of its ability to wrap, and because it provides configurable margins and spacing. RowLayout has a number of configuration fields. In addition, the height and width of each widget in a RowLayout can be specified by setting a RowData object into the widget using setLayoutData. The wrap field controls whether or not the RowLayout will wrap widgets into the next row if there isn’t enough space in the current row. RowLayouts wrap by default. If the pack field is true, widgets in a RowLayout will take their natural size, and they will be aligned as far to the left as possible. If packing is false, widgets will fill the available space, similar to the widgets in a FillLayout. RowLayouts pack by default. These fields control the number of pixels between widgets (spacing) and the number of pixels between a widget and the side of the parent Composite (margin). By default, RowLayouts leave 3 pixels for margin and spacing. The margin and spacing fields are shown in the following diagram. In the table below, the result of setting specific fields is shown. Each widget controlled by a RowLayout can have its initial width and height specified by setting a RowData object into the widget. The following code uses RowData objects to change the initial size of the Buttons in a Shell. Here is what you see when you run the above code. GridLayout is the most useful and powerful of the standard layouts, but it is also the most complicated. With a GridLayout, the widget children of a Composite are laid out in a grid. GridLayout has a number of configuration fields, and, like RowLayout, the widgets it lays out can have an associated layout data object, called GridData. The power of GridLayout lies in the ability to configure GridData for each widget controlled by the GridLayout. The numColumns field is the most important field in a GridLayout, and it is usually the first field an application will set. Widgets are laid out in columns from left to right, and a new row is created when numColumns + 1 widgets are added to the Composite. The default is to have only 1 column. The following code creates a Shell with five Button children of various widths, managed by a GridLayout. The table below shows the grid when numColumns is set to 1, 2, or 3. The margin and spacing fields in a GridLayout are similar to those in a RowLayout. The difference is that the left and right margins are grouped into marginWidth, and the top and bottom margins are grouped into marginHeight. Also, in a GridLayout you can specify verticalSpacing, whereas in a RowLayout, only horizontalSpacing applied. Note that FILL_ convenience styles set both fill alignment and grab. GridData style bits can only be used for boolean and enumeration fields. Numeric fields must be set directly. Let’s go back to our five-button example with three columns, and we will vary the horizontalAlignment of Button 5. One final point to note about grabbing. If a widget is grabbing excess horizontal space and its parent Composite grows wider, then the entire column containing that widget grows wider. If a widget is grabbing excess vertical space and its parent Composite grows taller, then the entire row containing that widget grows taller. The implication of this is that if any other widget in the affected column or row has fill alignment, then it will stretch also. Widgets that have beginning, center, or end alignment will not stretch – they will stay at the beginning, center or end of the wider column or taller row. The natural size of Button 5 is shown in the window on the left, below, and the 70-pixel wide, 40-pixel tall Button 5 is on the right. Note, however, that if the horizontalAlignment of Button 5 was FILL, then the GridLayout would not have been able to honor the request for a width of 70 pixels. One final comment about using width and height hints. Something that looks good on one platform may not look good on another. The variation between font sizes and natural widget sizes across platforms means that hard-coding pixel values is not usually the best way to lay out windows. So, keep the use of size hints to a minimum, if you use them at all. Then we start coding the example from the diagram. The code is below. 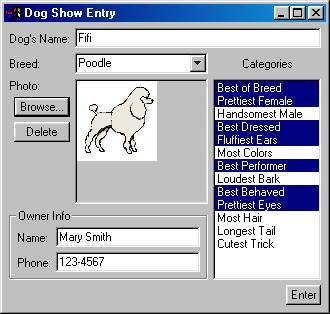 Note that we have added a bit of logic to make the code more interesting, for example, Browse… opens a FileDialog to read an Image file which the Canvas displays in a paint listener, Delete deletes the Image, and Enter prints the current dog and owner info. The example has been coded in a single main method to keep it as simple as possible. · There are 3 columns and 7 rows. · The dogPhoto Canvas grew wider and taller because it is filling and grabbing horizontally and vertically (we did not resize the Image, but we could have). · The dogBreed Combo grew wider because it is filling horizontally, and it is in the same column as the Canvas. · The dogName Text grew wider because it is filling horizontally, and one of the columns it spans is the column containing the Canvas. · The categories List grew taller because it is filling vertically, and it spans the same rows that the Canvas does. · Because the categories List grew taller, its vertical scrollbar disappeared (it did not grow wider). · The ownerInfo Group grew wider because it is filling horizontally, and one of the columns it spans is the column containing the Canvas. · The ownerInfo Group, as a subclass of Composite, has its own GridLayout with 2 columns and 2 rows. · The ownerName and ownerPhone Texts grew wider because the Group grew wider, and they are filling and grabbing horizontally in the Group’s GridLayout. · The browse and delete Buttons are indented slightly, and because they both fill horizontally, they are the same width. · The delete Button is vertically aligned at the top of its row. · The “Categories” Label is centered over the categories List. · The enter Button is horizontally aligned to the right of the 3 columns it spans. · The dogPhoto Canvas was created with width and height hints because we want the Image to be 80 pixels x 80 pixels, if possible. · The categories List was created with a height hint that was based on the List’s font times 12, because we want try to get the List to show 12 items initially. · Can the layout be done using a GridLayout, with maybe a few nested layouts? · Can the desired effect be more easily achieved with a resize listener? · Are you defining a general layout algorithm or just positioning widgets? First, we will look at how layouts work, and then we will create a new Layout class. Another example of writing your own Layout can be found in the Compound Widget Example section of “Creating Your Own Widgets Using SWT”, which shows how to achieve the same look using either a resize listener or a new Layout class. The computeSize method calculates the width and height of a rectangle that encloses all of the Composite’s children once they have been sized and placed according to the layout algorithm encoded in the Layout class. The hint parameters allow the width and/or height to be constrained. For example, a layout may choose to grow in one dimension if constrained in another. A hint of SWT.DEFAULT means to use the preferred size. The layout method positions and sizes the Composite’s children. A Layout can choose to cache layout-related information, such as the preferred extent of each of the children. The flushCache parameter tells the Layout to flush cached data. You would do this after changing anything about the children that might affect their size or position, such as changing the font of a child, changing the text or image of a child, adding a new child, adding children to a child, etc. (If the child can accommodate the change, then layout may not be necessary – for example, changing the font or text of a scrollable multi-line Text). Since these changes are done programmatically, they do not cause events to happen. Consequently, the parent doesn’t know about the changes, and has to be told through the layout method. This strategy reduces flash because the application can make several changes and then tell the parent to layout, and the children are only redrawn once instead of once per change. If layout() is not called and changes are made after the shell is opened, then the children may not be correctly laid out until the shell is somehow resized. Note that shell.open() causes a layout to occur. 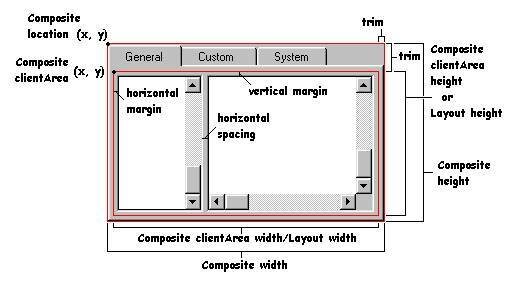 The computeSize methods of a Composite calculate the Composite’s preferred size, which is the size of its client area as determined by the Layout, plus its trim. The boolean parameter to the layout, computeSize, and pack methods is the changed flag. If true, it indicates that the Composite’s contents have changed in some way that affects its preferred size, therefore any caches that the Layout may have been keeping need to be flushed. When a Composite is resized, it asks its Layout to lay out its children by calling layout(false); therefore widget content caches are not flushed. This lets the Layout perform any expensive calculations only when necessary. Caching can increase performance, but it can also be tricky. You can choose not to cache at all – in fact, it is best not to try caching until your code is stable. When considering what to cache, be certain not to store any widget state, such as the text of a label, or the number of items in a list. If you have several vertically oriented Composite widgets in your application, you might choose to write ColumnLayout. We will show a simple version of a Layout class that lays out Composite children into a single column. The class has fixed margins and spacing. Children are given the same width, but they take their natural height. Here is some simple test code to test the ColumnLayout. The grow and shrink Buttons show a call to the Shell’s layout() method to force a re-layout after changing the width of one of the children. Calling layout() is the same as calling layout(true) which tells the ColumnLayout to flush its caches before setting the bounds of the children. The Shell is also told to pack() after laying out the children. This forces the Shell to take the new size. · If you are providing trimmings in your new Composite, make sure to override both computeTrim and getClientArea. · Never override layout(), but you may override layout(boolean). · Override setLayout to do nothing. · Override layout(boolean) to call your layout code. · Override computeSize to correctly compute the size of your Composite. SWT provides several different ways to lay out widgets. The simplest method, and the one you will typically use, is to use one of the standard Layout classes: FillLayout, RowLayout, or GridLayout.